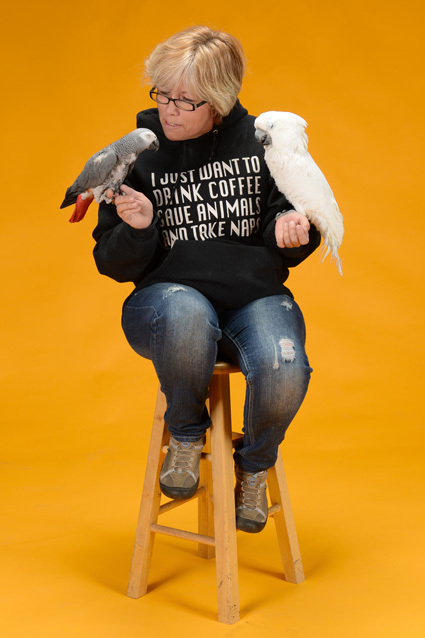 “Clyde is a good boy!” states the extremely social, white cockatoo (Clyde) as he and his buddy B.J., an African grey, entered the Oklahoma Magazine studio with their mom, Lisa Moser. It was a road trip for the two feathered friends–their day to tell their story and show-off for our camera. 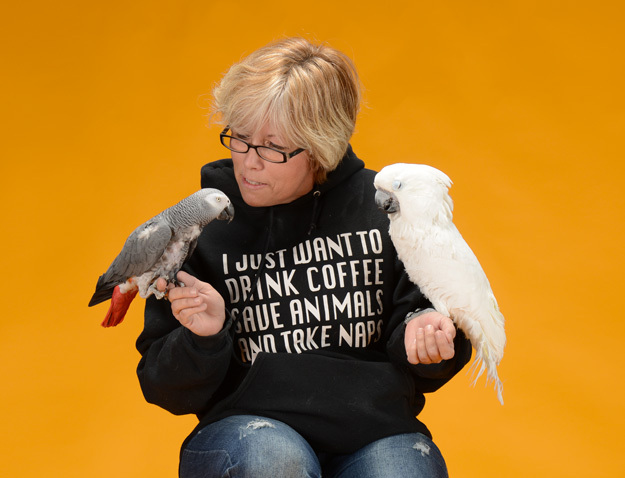 Moser is the founder of Soft Landings Parrot Rescue, Inc., a home-based, 501(c)(3) organization that serves dislocated companion birds – finding homes for those that are adoptable, while providing permanent sanctuary for those that are not. We hear a lot about animal rescues, but a parrot rescue in Tulsa, Oklahoma? Clyde and B.J. are two of over 25 birds that currently reside at Soft Landings, aka Lisa Moser’s family home. It all started six years ago when the family adopted an African grey named Cody Bird. “He was our first large parrot,” says Moser. She went on to talk about how Cody is madly in love with her daughter Ericka. Only a few months had passed following the Mosers welcoming Cody into their home when Lisa and husband Chad began discussing another addition. “I started following a rescue near Red Oak, Texas and they had a situation come up with a pair of cockatoos,” recalls Moser. It was an all to common situation – an adoption that didn’t work out. The Moser’s made the trek down to Austin to pick up “Sonny and Cher,” sight unseen. Upon arrival they were led into an empty, dark condo by a neighbor. 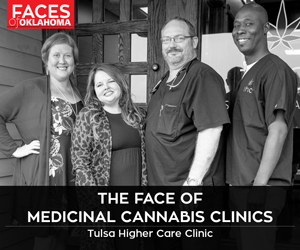 It wasn’t long before Moser knew that her heart was leading her to become more involved. In the meantime, Clyde joined the family. “My intentions were to foster him and find him a home,” Moser remembers. Instead, Clyde became her son Nathan’s bird. B.J. came to the rescue accompanied by a pair of cockatoos and a macaw. Their owner was moving to an assisted living center. “These guys are intelligent and live forever,” says Moser. “I have birds who have outlived their owners. We’ve had everything from it [the bird] is too loud and messy, to horrible abandonment cases,” she adds. “I’ve even heard ‘If you don’t take it, I’m just going to throw it outside!’” She doesn’t even know the number of small birds that have been found – thrown outside. Moser gets a lot more leads to surrendered birds than she does to potential adopters. Soft Landings works with other sanctuaries across the country both transferring and taking in birds. The rescue strives to educate owners, while promoting adoption over purchasing a bird from a breeder. Moser explains that parrots have the average intelligence of a six to eight-year-old child and the emotional maturity of a three-year-old. They need daily interaction, a healthy diet, exercise and proper veterinary care. The work associated with the busy rescue is anything but a “soft landing” for Moser who takes on most of the responsibility herself. Is she looking for volunteers? Always!